Mother Nature is doing a number on us this week. Goodbye fall, hello winter! Time for this North Idaho dog to change up some wardrobe essentials and GO OUT AND PLAY. Can you guess where I’m going? 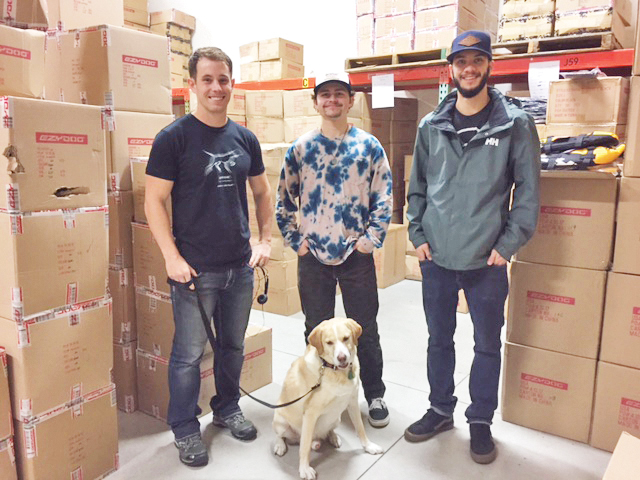 The warehouse crew at EzyDog takes a break from their busy day to stand with Drake. From left to right: Bryant Baxter, Chase Morfitt and Alex Martin. C’mon, join the pack with the Sandpoint distribution center and warehouse staff of EzyDog, located on Larkspur in Ponderay. John Hatcher, Ezy big DOG, (aka CEO), and Brady McClintik, VP of Operations welcome us to their EzyDog house. John started the company in 2003 with his watersport partner. They both liked dogs and their mission was “to create products that help us all live active and outdoor lives. Whether it is running, trekking or a day out at the beach, life is always better with furry friends by our sides.” I’m in! 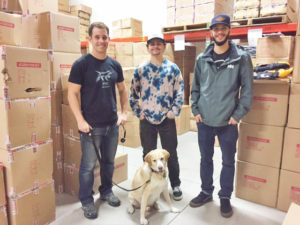 The human staff and their four-footed helpers oversee the distribution of products for North America, Canada and Mexico. John’s partner in Australia distributes to the rest of the world. The warehouse does not sell product. 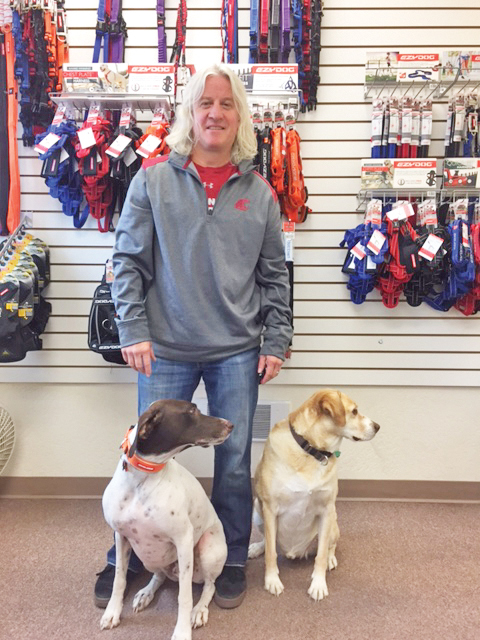 You can purchase EzyDog items at North 40, Carter Country and Pend Oreille Pet Lodge — all dog friendly! The Missus calls me her EzyDog. However, I am really an active four-seasons North Idaho dog who loves to roll in the grass, swim in the lake, cool off in the snow and gad about town. 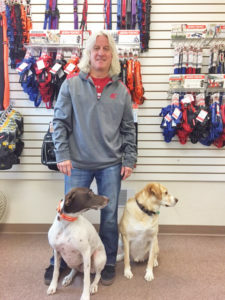 EzyDog CEO John Hatcher stands with his buddy Radar and Drake, who are apparently interested in a treat someone to the left of the photo is holding. Let’s bark up a storm for EzyDog! They have won so many awards with the pet business industry and the products are approved by the Animal Wellness Magazine just to name a few. I’m going to have fun with fashionable and functional gear for every season. EZY4Life!